Kids that are growing up around technology are learning to use it faster than I could ever hope to. They can work smart phones, computers, tablets, and all manner of electronics before they can make full sentences, and that’s really amazing. They can play video games and control the environment around them with the simple press of a button…and here it took me weeks to figure out my first DVD player! Yikes! 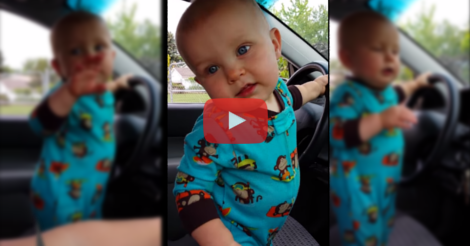 This mom was waiting in the parking lot for dad to run a quick errand, and baby’s favorite song came on! 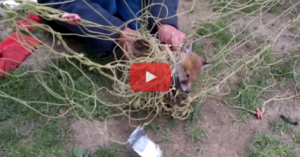 When mom realized what he was doing, she quickly started recording the adorable moment. Her son could barely stand without holding onto something, but he knew which knob would change the volume AND which way to turn that specific knob! Who needs to learn how to walk as long as they can enjoy their favorite tunes while waiting in the parking lot? They have a brief battle, and when he turns around to mom, his look just says “come on mom, you know you like the music!” I thought he might start crying towards the end, but it looks like he’s just happy to be alive! What a cutie! This Man Spots Something Odd In His Soccer Goal…When He Realizes What It Is, He Calls An Expert To Help Out!